Beginners need lots of practice handling the ball. These basketball drills for kids are geared toward the youngest players who are just learning how to bounce, toss, and catch a ball. Players will quickly start to build confidence as they conquer simple challenges and progress to more difficult ones. Every player will need a ball for these activities. Make sure your young players are using a youth size basketball. They'll experience greater success using a ball that fits their small hands. If you've got pre-school or kindergarten basketball players, these basketball ball handling drills are great for helping them become more comfortable dribbling, passing, and catching the ball. You can do these with one child or an entire team. Try one or all of them. If one challenge is too difficult, just move on to another one. Bounce the ball while pretending to walk up and down stairs. Start by crouching down as low as possible while dribbling. Start dribbling while walking "up the stairs" by gradually straightening your legs until you're all the way up on your tiptoes. Keep dribbling and walking on your tiptoes, then walk "down the stairs" by gradually bending your legs and crouching low to the floor where you started. 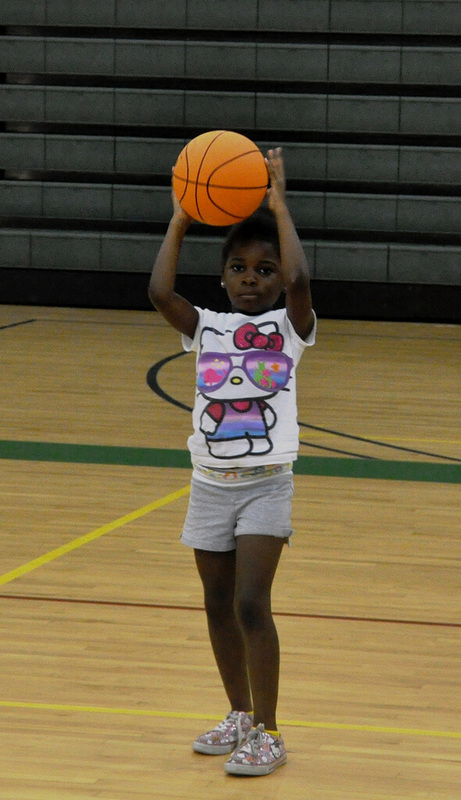 Standing in one place, dribble the ball with slow, high bounces reaching as high as possible. Gradually decrease the height and speed of the dribble until you're dribbling a few inches off the floor. Continue this pattern, dribbling low and high, like a yo-yo. See how long you can continue without messing up. Walk forward while doing the "Yo-Yo." Dribble the ball while standing in one place. While dribbling, lower your body down to the floor until you're in a sitting position with your legs out straight in front of you. Dribble it on the right side of your body with your right hand. Cross the ball over to the left side by dribbling it between your legs then transfer it to your left hand. Dribble on your left side with your left hand. While dribbling, lower your body until you are lying down ("Going to bed"). Dribble the ball with your free hand while pivoting around in a circle on your supporting hand. Using both hands, bounce the ball between your legs from the front to the back and catch it with both hands behind your back. Now try to bounce it from the back to the front and catch it with your hands in front of you. Repeat as quickly as possible. Bounce the ball as high as possible, run under it, and catch it. Bounce the ball, turn around in place, and catch it. Bounce the ball while doing different locomotor movements – walking, running, skipping, sliding, hopping, going backwards. Bounce the ball to a certain rhythm. See how high you can toss it and still catch it. Let it bounce if you need to. Toss ball up high and slightly forward, so you have to move to get it. Move under it and catch it before it hits the ground. Catch it after one bounce, 2 bounces, etc. Toss ball up, turn around in place, and catch it before it hits the ground. Catch it after 1 bounce, 2 bounces, etc. Clap your hands before you catch it. How many times can you clap? Toss ball up, touch the floor, and catch it. Reverse the order and run the elevator back up to the top floor. Flip the ball out in front of you with a backward spin, so it bounces and comes back to you. Flip it, turn around, and catch it. Flip it, turn around, clap, and catch it. This drill is a spin-off of a popular kids game. 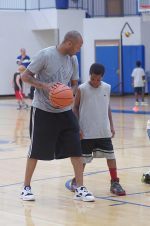 It teaches players to keep their head up while dribbling. Coach stands at one end of the court while all the players line up on the other end. Every player has a ball. Object of the game is to be the first player to dribble the ball up the court and cross the finish line. Players have to dribble to advance up the floor. Coach stands on the baseline and holds up either a red, green, or yellow piece of paper. Players learn to keep their eyes up while they're dribbling because they have to see the colors to know what to do. If they perform the wrong dribble, they must go back to the beginning. Don't Forget...Basketball Should be Fun!